The Grand Canyon. It is one of the seven wonders of the natural world. It is amazing, and while there are other canyons around the planet, there is nothing that is quite like it. It is a destination that people come from around the world to see; and it is a destination that lives up to the hype that it has received. Unfortunately, because it is a popular destination, the Grand Canyon is also one of the most crowded spots in the National Park system, especially during the summer months. At times like this, it sometimes feels like the hordes of people at the park are the spectacle, and not the natural beauty. Fortunately, there is a solution to this problem, and that solution is hiking into the Grand Canyon. While the Grand Canyon can be experienced by merely seeing it from observation points, in my opinion, the best way to experience it is to hike into the canyon. This allows you, the visitor, the opportunity to get up close and personal with the geology of the park, and to experience the true vastness of the canyon. However, some of the trails have some of the problems that the viewpoints have: massive crowds of people that detract from the experience of being one with nature. Again, there is a solution. On the far side of the South Rim, there is a trail that has great views and provides any visitor with the solitude that will allow them to full bask in the majesty of the Grand Canyon. That trail is the Hermit Trail. The Hermit Trail leaves from Hermit’s Rest, which is a viewpoint that is only accessible by National Park Service bus during the spring and summer months. From the viewpoint, the railhead is about five hundred feet west. The trail starts and descends through a series of switchbacks in a sparsely populated pinyon pine forest. 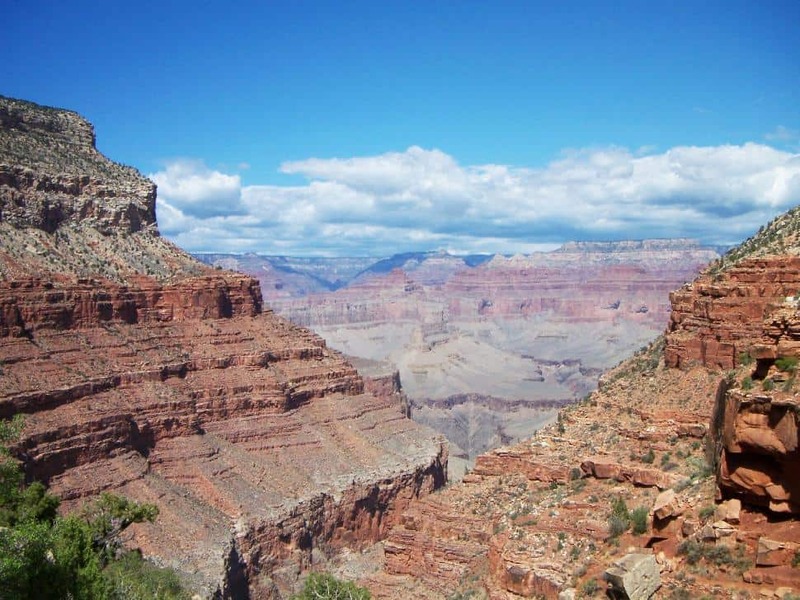 The trail snakes south at first, into an “finger” or “slot” of the Grand Canyon, which is a different – and somewhat welcome change from the Rim, Kaibab, Bright Angel, and Longview Trails which all head directly North into the main body of the Canyon. The descent at this point is gradual, and the view allows views of the rim along the Southern, Northern, and Western regions of the canyon. The trail then levels out into long, sloping switchbacks that descend into the Canyon, some of which are covered with rocky “cobbles”. Any hiker should be aware at this point that the descent into the canyon is the easy part of the hike, and as the trail starts at 6,640 feet, and ends at the spring at 5,680 feet, there is a fair amount of elevation gain on the return path up to the rim. After the long, rocky switchbacks end, the trail levels out into a lightly forested plateau – known as the “Hermit Basin”. Aside from the comforting shade that the trees provide, this first plateau also demonstrates the grand size of the canyon. As you look up, you can see giant slabs of rock that have eroded away over the years that truly make you the hiker feel puny. But as you look down, you can see the remainder of the canyon which makes you feel insignificant. It should also go without saying that there are numerous great photographic opportunities at this point on the trail – and before and after as well. Once you are done admiring the view, a decision will need to be made about which portion of the trail you want to follow. The main Hermit Trail splits off to the North, and begins to descend into the canyon proper. The rest of the trail continues toward the Southwest, and is the “Dripping Springs/Boucher Trail”. The trail to Dripping Springs follows what I call a series of small “dips”. It snakes right under the rim, and ascends, and descends a series of small hills. Depending on what time of the year it is, and what time of day it is, the rim above provides some much needed shade over the trail, cooling the temperature dramatically. In conjunction with the mild up and down motion, the trail snakes in and out of a series of very small slot canyons that provide excellent cut-away views of the main canyon to the north. After this series of dips and right and left turns, the trail arrives at Dripping Springs. Once you are done marveling at the springs, and the canyon, it is likely time to turn around, as I did, and head back up to the rim for total roundtrip distance of seven miles.